Erzsébet híd, or Elisabeth Bridge, which was completed in 1903, is the second newest of Budapest’s Bridges. The bridge was named after the popular Dual Monarchy Queen Elisabeth, who was assassinated in 1898. Her bronze statue sits in the middle of a small garden in Buda’s Dobrentei Square, just below the Gellért Hill near the Rudas Baths. Situated at the narrowest part of the Danube, the Elisabeth Bridge is only 290 metres long. 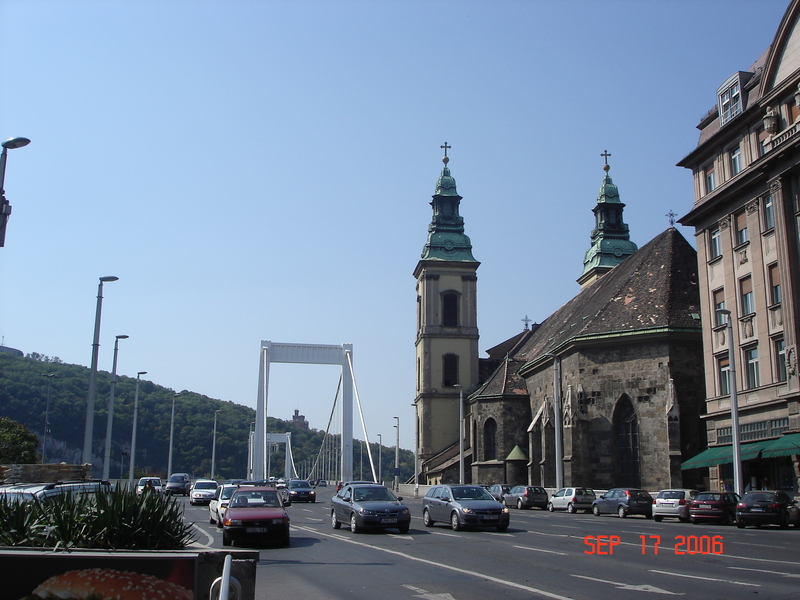 On the Pest side it ends in March 15 Square, site of the 13 century Inner City Parish Church, (Budapest’s oldest place of worship) and the Mátyás Prince (Budapest’s most famous restaurant) At the Buda end, it finishes in a death-defyingly sharp bend at the foot of Gellért Hill. The Erzsébet was the only bridge in Budapest which could not be rebuilt in its original form after World War II. The current slender white cable structure with its hexagonal spars and thousands of steel wires was designed by Pál Sávoly. 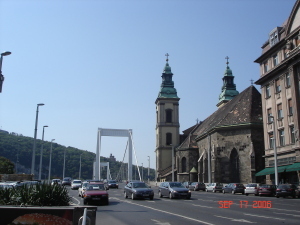 At the time of completion, it was a first in Central Europe. It considered one of Budapest’s loveliest bridges.